25th March 2016 – On 23 March, ESPO released the results of its recent environmental review 2016 during the PORTOPIA conference in Lisbon. 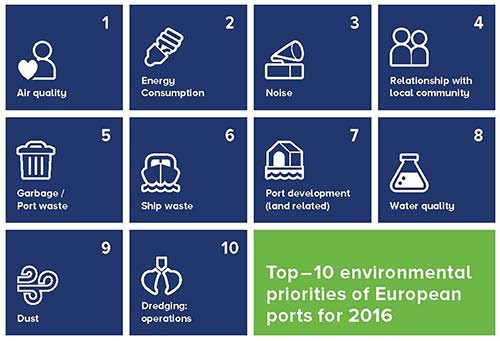 The aim of the review is to update the top 10 environmental priorities of European ports and to produce further benchmark figures in key areas of port environmental management. “This data is important as it identifies the high priority environmental issues on which ports are working and sets the framework for guidance and initiatives to be taken by ESPO” says Antonis Michail, senior policy advisor and EcoPorts coordinator at ESPO. Air quality remains the number one priority of European ports, as in 2013. This is fully in line with the priority given to the subject at EU political level. The implementation of the Sulphur Directive and the ongoing political process on the air quality package have a clear role to play here. Overall, all the priorities of the 2013 top 10 remain in the top 10 of 2016. There are though some variations in the ordering of the priority items. Therelationship with the local community, port development and water quality are gaining importance. On the other hand, the handling of port waste, anddredging move down the top 10 scale. Energy consumption becomes the second priority issue of European ports. Since 2009, the importance of energy consumption has raised year over year. One of the reasons is, of course, the direct link between energy consumption, and the carbon footprint of the ports and Climate Change. Noise appears in number three and has remained a top priority issue since 2004. Relationship with the local community climbs at number four and confirms again the acknowledgement of ports on this important topic. It is clear that ports grant their license to operate and to grow from their local communities. The two waste items, port waste and ship waste, remain in the top 10 on the 5th and 6th position respectively. This shows once more the significance of waste management in ports and the ongoing discussion on the reception of ship generated waste as part of the revision of the port reception facilities directive. The climbing of water quality at number 8 can be linked with the implementation of the water framework directive and the ongoing discussions on the potential impact of washwater discharges by open loop scrubbers. Finally, it is interesting to note that port development (land), dredging operations, and dust are issues that have appeared consistently in the priority list of the European port sector over the last 20 years. Building on a long tradition that goes back to 1996, ESPO and EcoPorts regularly monitor the top environmental priorities of European ports authorities. The 2016 exercise builds on data from 91 ports in 20 EU Member States. The outcomes that also include further benchmark figures in key areas of port environmental management and the analysis of trends regarding those over time are incorporated in the latest PORTOPIA Sustainability Report, released on 23 March.